The Internet marketplace is vast and there are millions of businesses competing for your customer’s dollar. Building your reputation online is the best way to grab the customer, keep his business and increase profits. Online reviews can make or break your company, so it is important to get legitimate online reviews for your business. Many businesses find themselves in a quandary. They can’t sell products because they don’t have good reviews, but they don’t have reviews because nobody is buying the product. Many companies simply buy reviews from content writers who will sing the company’s praises. While this may seem like a good idea, it can backfire. Professional writers often write in a specific “voice,” and their tone may come across as sales-y, or overly promotional. Customers can see through this a mile away and you will quickly lose their trust. Share your product or service with friends or family and ask them to write you a review. These reviews will be genuine since they are from people who have actually used your product. After you have gotten a significant amount of reviews, you will find a spike in your sales and increased customer interest in your product or service. If you have customers who have used your service or product in the past, ask them to write you a review. Many company owners find that simply asking is enough to get a positive response. Some customers may even include a photo of themselves using your product, which is a huge boost. If you ship products to your customer, include a small card asking them to submit a testimonial or review for your site. Some companies send out samples of their products to focus groups, bloggers and consumers. This is a great way to get people using and talking about your product. Simply send the product and tell the user that you would like an honest review in return. Offer an incentive, like a discount off of a future purchase, in exchange for a review that includes a photo of the customer using the product. Sharing a photo of your product on social media is an excellent way to get mass numbers of people talking about your company. When more people see your product and the positive feedback from other users, you will increase interest in your product, which will lead to better online reviews. Use sites like bulletin board sites where people can “pin” photos of your products with descriptions and glowing testimonials. Follow people who “pin” your product and ask them to write a review for your website. When it comes to getting legitimate reviews for your site, there are many ways to get the word out about your product or service. 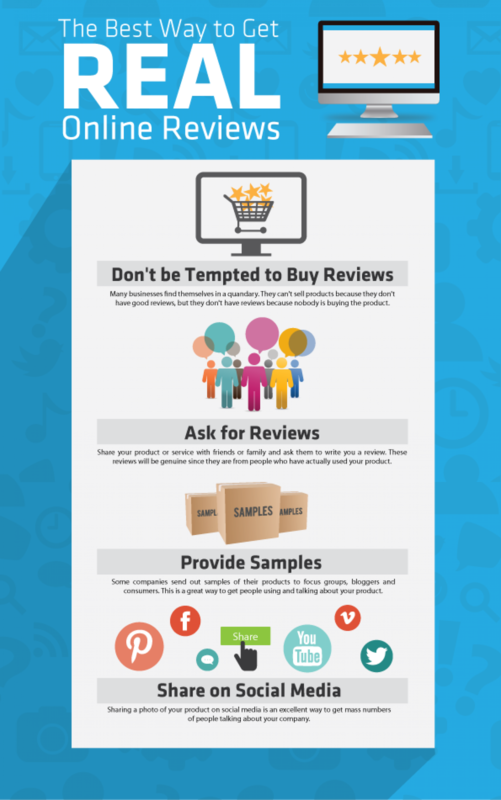 While some companies buy reviews, this strategy is not always effective. By asking for positive reviews, sharing your products on social media sites and providing high-quality products, your company will see your profits soar.